Fulham beat Nottingham Forest to extend their winning run to four games and climb to fifth in the Championship. The home side struggled to break down Aitor Karanka's resilient Forest defence in the first half despite dominating possession, and they introduced new signing Aleksandar Mitrovic early in the second period. The on-loan Newcastle striker almost marked his debut with a goal, but his header was cleared off the line by Worrall. Forest offered little attacking threat for much of the game and they have now failed to score in six of their past seven Championship games. The Reds, who gave debuts to four of their six deadline day signings, slipped to 16th in the table, having lost four of Karanka's first five games in charge. "We played a good game today, we knew we were going to find it a tough opponent. "We showed quality and patience, created some chances in the first half. In the second half, we didn't start so good. With some movement from the bench we started to play well. "This is our sixth consecutive win at home, the sensation is good, but we need to be quiet, calm, show humility, keep working hard and be ready for the next game." "I'm never happy when I lose a game but I think the performance today has been completely different to our last game. "We can't forget that we've played against one of the best, if not the best, team in the league and the performance has been good. "Today is a completely different feeling, today is a really positive feeling because the players showed me that I can trust them." Second Half ends, Fulham 2, Nottingham Forest 0. Substitution, Fulham. Denis Odoi replaces Matt Targett. Offside, Nottingham Forest. Eric Lichaj tries a through ball, but Apostolos Vellios is caught offside. Goal! Fulham 2, Nottingham Forest 0. Stefan Johansen (Fulham) left footed shot from the centre of the box to the bottom right corner. Attempt saved. Floyd Ayité (Fulham) right footed shot from outside the box is saved in the bottom left corner. Assisted by Aleksandar Mitrovic. Substitution, Fulham. Floyd Ayité replaces Lucas Piazon. Attempt missed. Matthew Cash (Nottingham Forest) left footed shot from outside the box is close, but misses to the right. Assisted by Ben Osborn. Foul by Oliver Norwood (Fulham). Attempt saved. Apostolos Vellios (Nottingham Forest) left footed shot from the centre of the box is saved in the centre of the goal. Attempt saved. Ben Osborn (Nottingham Forest) left footed shot from the left side of the box is saved in the centre of the goal. Assisted by Apostolos Vellios with a through ball. Foul by Lucas Piazon (Fulham). Lee Tomlin (Nottingham Forest) wins a free kick in the attacking half. Oliver Norwood (Fulham) wins a free kick in the defensive half. Foul by Ashkan Dejagah (Nottingham Forest). Substitution, Nottingham Forest. Apostolos Vellios replaces Ben Brereton. Corner, Nottingham Forest. Conceded by Ryan Fredericks. Attempt blocked. Aleksandar Mitrovic (Fulham) header from the centre of the box is blocked. Assisted by Stefan Johansen with a cross. Corner, Fulham. Conceded by Joe Worrall. Substitution, Nottingham Forest. Ashkan Dejagah replaces Adlène Guédioura. Substitution, Nottingham Forest. Lee Tomlin replaces Kieran Dowell. Michael Mancienne (Nottingham Forest) is shown the yellow card for a bad foul. Goal! Fulham 1, Nottingham Forest 0. 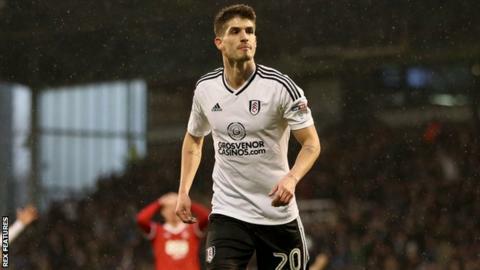 Lucas Piazon (Fulham) right footed shot from the right side of the box to the top right corner. Assisted by Oliver Norwood. Attempt missed. Aleksandar Mitrovic (Fulham) header from the centre of the box is high and wide to the right. Assisted by Stefan Johansen with a cross following a corner.